It is not surprising to hear about a flood in the state of Florida — this scenario takes place on a regular basis. However, now there is a new kind of flood that is taking place: an insidious and never-ending flood that is threatening the entire state. This new and dangerous flood comes in the form of an ongoing encroachment of the sea into the Everglades. The Everglades is a huge wetlands that once stretched from Orlando to the southernmost tip of the state. Over the past century, about half of the Everglades has been drained, filled, and reclaimed for use as farmland or residential development. What remains of the original Everglades is now largely protected, and it still covers a vast area of over 1,500,000 acres, or 2400 square miles. Since the 1970’s, the public has become educated about the importance of protecting this huge ecosystem, and direct damage and encroachment from human action has slowed considerably. Unfortunately, this does not mean that the Everglades is now completely unharmed by human activity. Damage to the ecosystem is continuing in many ways; for example in the form of pollution from pesticides and agricultural chemicals. But even more alarming than these pollutants is the rapid and seemingly unstoppable encroachment of the sea into the Everglades — this is a threat that has the potential to kill the entire system. The Everglades begin near Orlando, where water from the Kissimmee River flows south into shallow Lake Okeechobee. During periods of heavy precipitation, Lake Okeechobee will overflow, and this forms an extremely wide and slow-moving river that empties into the Florida Bay. This river is not a conventional one — it does not have banks or swift water flow, nor does it even have much visible water surface. The Everglades has been called a ‘river of grass’, and this description deftly sums up its appearance. The vast ‘river of grass’ flows very slowly over a shelf of porous limestone, which is covered by a large amount of peat. The peat supports the plant life, which is mostly sawgrass, and the tangled root systems of these important plants help to hold the whole system together. Recently, scientists have been finding that global sea level rise is pushing salt water into the Everglades system. As the sea water encroaches inland, it enters the limestone foundation that lies under much of the state, and it rises up under the Everglades. The saline water comes up from the porous limestone and seeps into the peat that supports aquatic plants and animals, creating conditions that kill off that life. If left unchecked, this development could finish off a national treasure: the great Everglades. 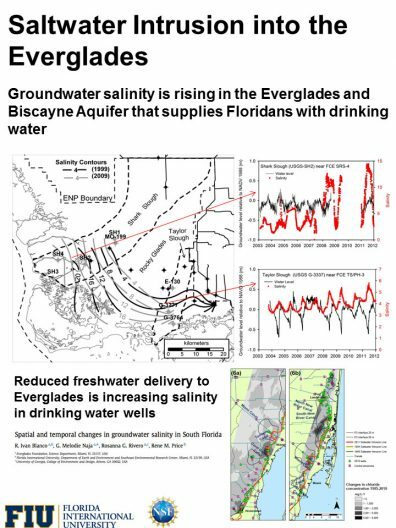 Even more devastating than the loss of the Everglades, and directly tied to its fate, would be the pollution of the Biscayne aquifer that lies below the Everglades. This aquifer is absolutely essential to support human habitation and agriculture in the state of Florida, with 90% of the freshwater needed to support communities and farming coming from this source. Now, however, as the Everglades is threatened by saltwater, the aquifer beneath is also at grave risk of pollution. One idea to hold off the encroachment of the saltwater is to put more fresh water from the aquifer into the Everglades, in order to hold back the salt. Today, the restoration and protection of the Everglades is critical not only to the flora and fauna that live there, but to the millions of human residents who depend on the Biscayne aquifer as their only source of fresh water.